Swim Baits...what started off sounding like “western bass fishing hype” has proven to be one of the hottest big bass techniques for several years now! In the early days, many viewed Swim Bait fishing as a few “Oversized” baits being fished by a few die-hard big bass hunters in the west. Swim Baits are now main stream and they have turned into one of the most productive lure categories across the nation and around the world! Put simply, swim baits have become one of the most productive techniques anywhere in the world...period! The goal of this “Outdoor List” is to bring you solid basics to get you started in understanding the world of Swimbaits. While there are too many baits to list all that's available, I wanted to bring you a comprehensive list to get you started in your Swim Bait fishing. To complete this list I went to one of the most respected and knowledgeable people on this subject, Matt Paino. Matt is the president of Optimum Bait Company. Matt has been in the swim bait business for many years. With Matt’s help, here is our list of basics for understanding and choosing the right swim baits for your needs. Here is our top 10 list for Swim Bait Basics (in no particular order). Method: The Fred Roumbanis’ Boom Boom swimbait is designed to fish with a slow retrieve speed. It features a quivering head action, tight body roll and thumping tail kick. This panic action entices lurking fish into committing to strike the bait. Hold the rod up to keep it shallow, or down to reach deeper depths. Rigging: Bait is rigged with a bottom treble hook that pulls free. Rigging: The Swimmer`s body features a slot so it can be fished weedless with a weighted (or not) offset hook, or it can be rigged with an open hook bullet/type jighead when fishing open water. Perfect for Swimjig and Chatter Bait Trailer!! Method: Slow to Medium steady retrieve speeds produces gliding action from 1.5 feet to 3 feet wide. Method: Action is very tight between joints. Produces a head body roll while tail kicks back and forth. It can be fished with multiple retrieve speeds. Creates reaction strikes when burned. Water Type: Clearer warmer water. You have probably realized by now, that there are many options when it comes to choosing swim baits. 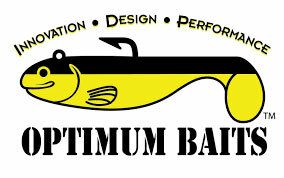 So, in additon to Matt Paino's top ten list, we are providing a list of other swim baits that may intertest you.